October is a month where some people decorate their yards with ghosts and gravestones and stories about haunted cemeteries are shared. However, it’s a wonderful time, with the leaves starting to change color, to learn more about cemeteries and truly appreciate them. Cemetery design can range from small, simple family plots to expansive memorial parks and arboretums (like our own Bellefontaine Cemetery in St. Louis). While cemeteries weren’t always designed like this, after 1830, more thought was put into cemetery design, incorporating winding roads and vistas and places where people could visit their departed loved ones. Sometimes, families could spend an entire day in these park-like settings (especially since there weren’t always public parks). The book Cemeteries is a good place to start to learn about the diverse types of cemeteries, from small, rural plots to places that encompass acres of trees and landscape. When you visit a cemetery, you may start to notice certain symbols or designs. For example, markers for children sometimes have a lamb. Or, you may see an open book or a hand with a finger pointing towards the sky or a carved willow tree. 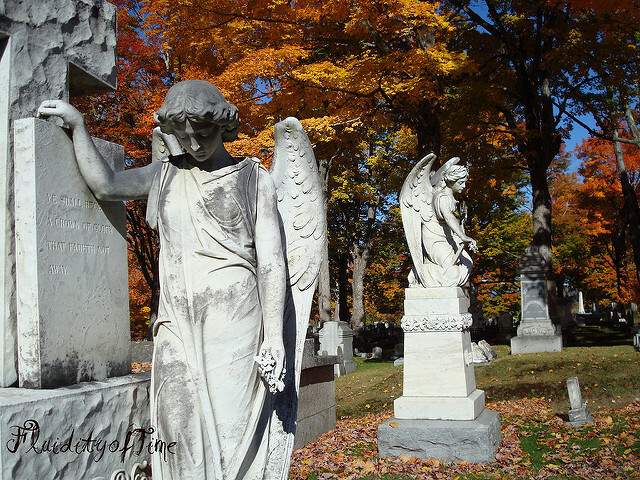 If you visit several cemeteries, you may notice that you are seeing the same figure or angel (especially if you visit several cemeteries in the same area). We have books in our collection like Stories in Stone, which explain many of the symbols on stones and markers. While cemeteries may seem spooky, they’re not quite as a scary in the light of day. Cemeteries are places that can make us reflect upon not just the mortality of those who are buried there, but our own mortality. Even a small cemetery can be moving, provocative places that encourage reflection. We have several books in our collection to inspire you to explore these marble towns (and we even have a list to get you started).